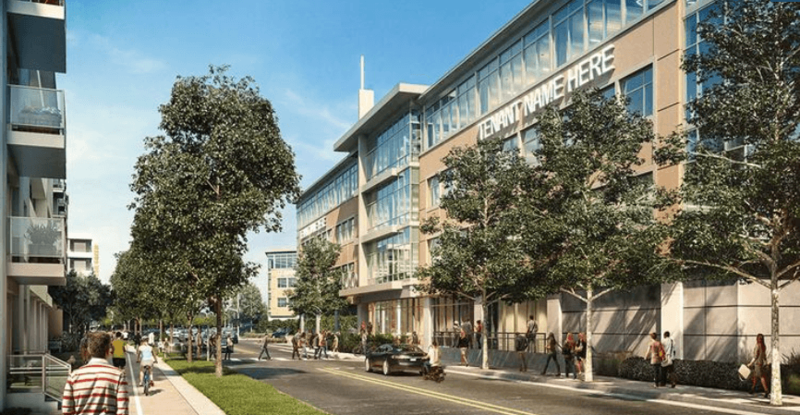 The lease marks the co-working company’s first foray into San Mateo and the mid-Peninsula and comes on the heels of plans to open a second location in downtown San Jose. WeWork is filling in the gaps of its footprint between San Francisco and San Jose, this week announcing it will take over the last of the remaining vacancy at a San Mateo office development recently completed by developer Hines. The coworking company plans to move into about 96,000 square feet on four floors at 400 Concar Drive, one of two buildings in Hines’ 400/450 Concar creative office complex steps away from the Hayward Park Caltrain Station. The 305,000-square-foot development has stood 70 percent leased since it was completed in early 2017. The lone tenant in the complex has been software maker Medallia, which in 2016 signed a lease for all 210-115-square-feet at 450 Concar. Now, the veritable co-working giant WeWork has staked a claim to an entire building in the complex, where it will offer 1,650 desks when it opens its doors in December. The news of the lease comes weeks after New York-based WeWork also announced it would open a second location in downtown San Jose, meant to meet overflowing demand from its existing downtown location at 75 E. Santa Clara St. Amazon.com’s secretive Lab126 division leases some of the co-working company’s 75,000 square feet in Santa Clara Street building, and entrepreneurs and small companies have maxed out the rest of the space in the building.